Green Point & Danger Point. We continue our trip along the Cape Peninsula coastline visiting the various lighthouses found along its shores. The first lighthouse cannot be visited as it is no longer in existence. 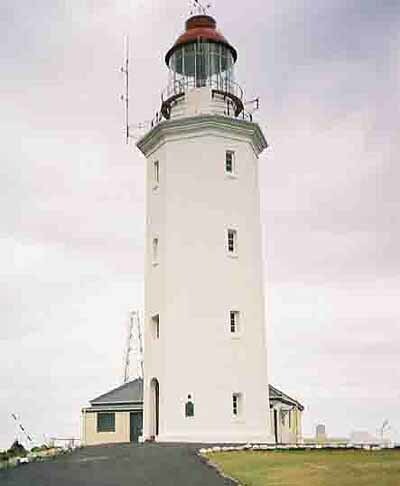 It was the Mouille Point lighthouse and stood in the grounds of the present day Cape Technicon at Granger Bay. All that is left of it is its circular base in the Technicon grounds. When it was still in existence the tower was plastered and painted white and had a dioptric lamp which used about 730 gallons of sheep tail oil per annum. The lighthouse was finally decommissioned on the 15th April 1906. Unfortunately during its lifetime a number of ships ran aground on its rocky doorstep. The first ship was the RMS Athens which ran aground in May 1865 and two months later a second ship "The Piscatua " was also wrecked on the same spot. The RMS Athens was a mail steamer belonging to Union Steamship Co. It had a crew of 29 who all perished when the ship sank. The sea on the day of the wrecking was extremely rough and as the ship tried to steam out of Table Bay it was swamped by some large waves which put out the boiler fires leaving the ship to the mercy of the seas. The ship broke up rapidly when it hit the reef and today all one can see of the ship is its engine block. 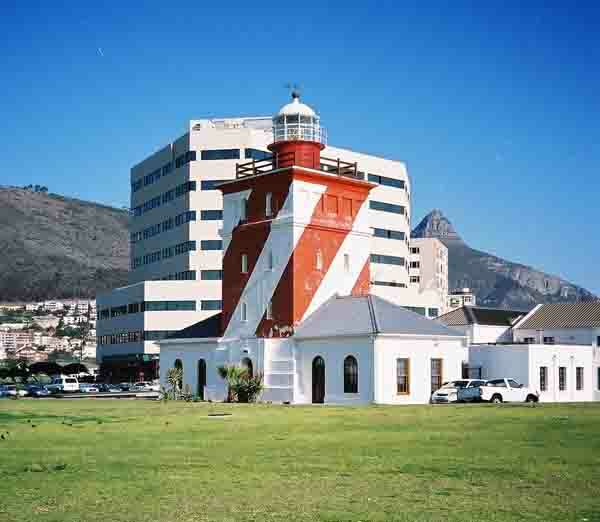 A few kilometres along the coast is the Green Point Lighthouse which is today mistakenly called the Mouille Point lighthouse by some people. It has red and white diagonal stripes and a number of other navigational aids. The most well known aid is its foghorn which when the mist descends on Cape Town and Table Bay is used to warn ships of the dangers of the coastline. Because of the foghorn the lighthouse has been given the nickname of "Moaning Minnie". Green Point lighthouse has witnessed many a ship wrecked on its doorstep with the latest wreck happening in 1966 when the SS Seafarer ran aground during a gale force northwest storm. Fortunately no lives were lost as helicopters from the Ysterplaat airbase were able to lift people off the stricken vessel and land them safely on the beach. Following the Atlantic coastline around the Cape Peninsula we come across the 100 feet high Slangkop lighthouse at Kommetjie. This lighthouse is the tallest coast iron tower on the African continent. It sections were cast in 1914 but it was only erected and commissioned in March 1919. The lighthouse although fully automated is still manned for security reasons today. Since its construction no ships have run aground near it. A fishing trawler however ran aground in the vicinity of the island in Kommetjie during the 1960's and was salvaged and taken by road to Cape Town where it was refloated. The only ship to run aground near Slangkop Point was the SS Clan Monroe which did so on the 2nd July 1905. After sitting high and dry on a rock shelf just below where the lighthouse now stands it eventually rotted away and sank below the waves where it still lies today. Divers sometimes dive on it on looking for trophies. The next lighthouse along the rocky Peninsula coastline is the Cape Point Lighthouse which is built on an outcrop of rock about 87 metres above the sea on Diaz Point. This lighthouse took six years to build and was finally commissioned in 1919. The first lighthouse at Cape Point was built in 1860 and was built on top of Cape Maclear about 250 metres above the sea. Unfortunately the lighthouse was not very effective as it was often covered in mist and could not be seen by shipping. In 1911 when the Portuguese steamship "The Lusitania " approached Cape Point the lighthouse was covered in mist and the ship sailed too close to the point and ran aground on Bellows Rock. The Lusitania immediately lowered its lifeboats and fired off a number of flares to attract the attention of shipping and the lighthouse staff on top of the hill. Soon help was at hand and by midmorning of the following day everyone aboard had been rescued. This shipwreck turned out to be one of the most successful rescue operations carried out on the coastline in its time. The wreck which was high and dry on Bellows rock eventually slipped off the rock and now lies in about 40 metres of water close to the base of Bellows rock. This shipwreck was one of the main reasons the lighthouse was relocated to where it stands today. The next lighthouse on our voyage around the coastline is Cape Hangklip lighthouse. It is situated on the eastern side of False Bay near Cape Hangklip. The lighthouse is a circular reinforced concrete tower twenty two metres high and was built in two days in November 1960. 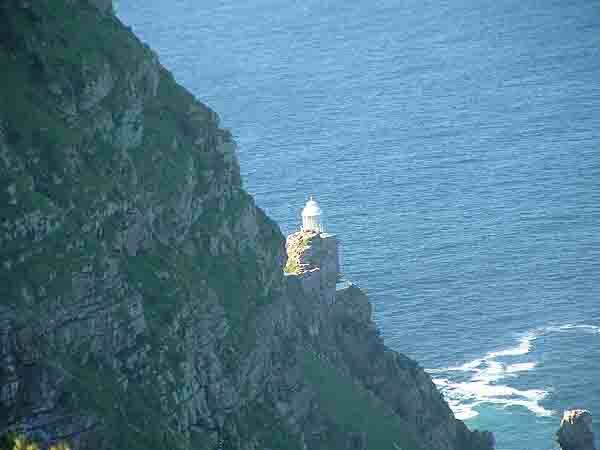 It is an un manned lighthouse and is monitored from Cape Point. Over the years a number of ships were wrecked at Cape Hangklip. They are the "Ternate" which was a Dutch wooden sailing ship which ran aground in 1680 and the German sailing vessel called the" Louise Scheller" which ran aground in 1882. 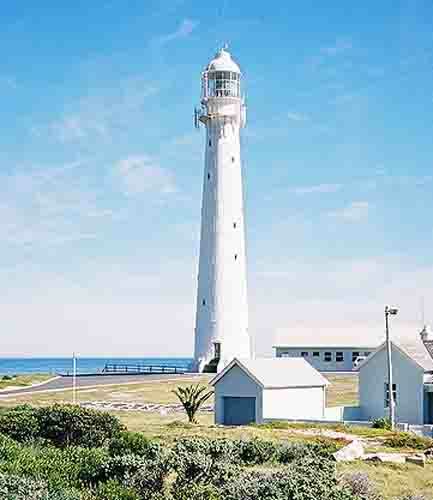 There are many more lighthouses along the South African coastline but the last one that we will visit on this journey is the lighthouse at Danger Point which was built in 1895. It has an 18.3 metre hectagonal tower which was constructed of concrete blocks. It was at first painted with vertical red and white stripes but later the colour was changed to white with the lantern being painted red. The area where it is situated is a burial ground for ships and there are no fewer than seven shipwrecks in the vicinity of the lighthouse. The most well known wreck being the Birkenhead which ran aground on the treacherous Birkenhead reef in February 1852. Of the 638 people on board at the time of the wrecking 445 perished. All the women and children on board were saved. The bulk of the passengers on the Birkenhead were soldiers and they were ordered to line up and to stand to attention on the decks while the women and children were placed into the lifeboats and rowed to safety. The Birkenhead was badly holed when it struck the submerged rock and sank quickly taking with it many of the men who were standing on the decks waiting to be rescued. The reason for the troops being lined up on deck was that their commanders were afraid that their men if allowed to swim for it would swim to the lifeboatsand possibly capsize them drowning the women and children on board. This drill became known as the Birkenhed Drill where women and children were rescued first. The strip of coastline between Danger Point and Cape Agulhas lighthouses is home to no less than 140 shipwrecks. In the area are many uncharted rocks a short way offshore hence the large number of ships that have foundered along this stretch of coastline. With the building of the lighthouses along the coast many ships have been saved from a watery grave as dangerous rocks are now charted and the lighthouses warn them of the dangers in their vicinity. Lighthouses are interesting places to visit and if you are a diver many of the wrecks I have written about can be dived. Why not take the opportunity of hiring one the refurbished houses found at many of the lighthouses along the coast and enjoy a weekend away from it all. You might even find some long lost treasure on some of the wrecks in the vicinity.